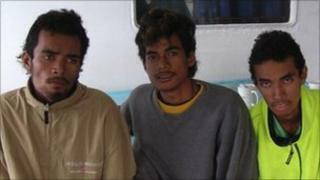 The boys - Samu Perez and Filo Filo, both 15, and Edward Nasau, 14 - had gone missing from Atafu atoll in a small aluminium boat after an annual sporting event on 5 October. Mr Fredricsen said the boys had a small supply of coconuts on their boat, but that it had run out after two days. "They've got a lot of gusto, a lot of strong mental spirit," he said, adding that though they were physically in a bad way, they were "mentally [...] very strong". An aunt of Samu Perez told the BBC that the family had already held a memorial service for him and that everyone had been devastated. "My mum, she cried every day and every night," Fekei said. "We believed he was still alive anyway, we thought that God was still with them." She said she thought the boys might have been trying to sail to Australia or the US. After speaking to Sam on the telephone, she said: "He was asking for forgiveness. I think they did learn a big lesson".